The MX Award was initiated with the goal to identify and facilitate innovative solutions in the field of production logistics and make them publicly available. Accordingly it is the goal to set up a network for the communication and creation of Best Practices in order to promote cross-sector international cooperation. 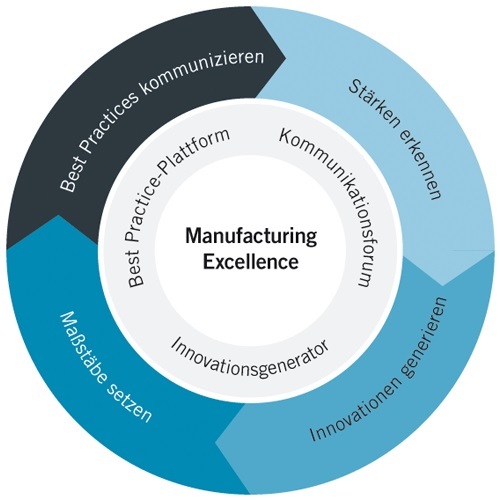 The phase model of the MX Award "Recognizing Strenths - Generate Innovation - Setting Standards - Communicate Best Practices" illustrates this claim as a communications platform as well as a generator of innovation in research and practice. The paramount goal of the Manufaturing Excellence is to promote a cross-sector collaboration in order to create a network for communication between experts in research and practice. Innovative and creative solutions are not supposed to just strengthen the international competitiveness but also to reinforce Germany as an industrial location in an holistic interplay. The leading thought of the Manufacturing Excellene Award is: "Recognising Strengths - Setting Standards". 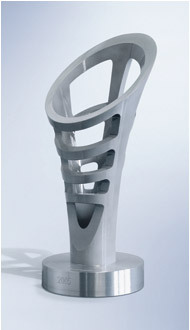 The MX Award in Germany was founded in 2004 based on the model of the successful MX Awards in Great Britain. For almost 30 years, Best Practice solutions have been rewarded and businesses honored. The MX Award in Germany is the established equivalent and a reputable Benchmarking competition for Best Practices in the industry. The phase model of the MX Award clarifies the immanent claim of the competition as a platform for Best Practice solutions and communication forum as well as a generator for innovation. The identification of strengths of other companies or sectors is a necessary basis for the development of the own requisites and to adapt those. The result is the opportunity to generate Innovations which represent Best Practices solutions and which can be incorporated in the continuous knowledge process. Due to the primary intension the MX Award's organizers focus the dissemination of Best Practice solutions and the support to identify solution strategies as well as their implementation - not just the determination and honoring of great concepts. The communication and dissemination of successful solutions is conducted through the yearly publications of the results in the MX Report as well as through the direct knowledge transfer in the activites of the MX Award: MX Tour, MX Dialogue and MX Membership.